Campers' Paradise is a bird-watcher's paradise, too! Our Island's forest, marshes and shoreline attract a bevy of wild birds. 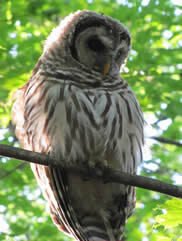 When you come to Campers' Paradise, keep your eyes peeled and let us know what birds you spot on -- or off -- the island. 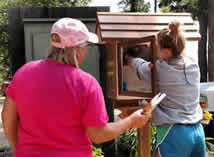 To add a bird to the list, tell us in the office or send us an e-mail at info@campersparadise-mn.com. During the off-season, the Wollin and Whiteman families had a brainstorm. 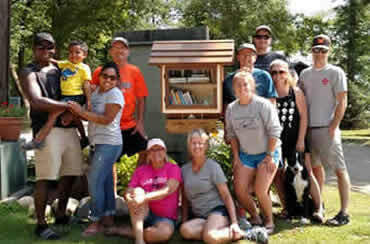 Why not build a Little Free Library (LFL)for Campers' Paradise? So they did! The Island now boasts a cabinesque LFL open to anyone interested in "checking out" a summer beach read or leaving one for others to enjoy. Here's how it works: you see a book you like, you borrow it and return it when you're done. If you really, really like it, you can keep it. If you've just read a super book and want to share it, put it in the library. No library card, no sign-in/sign-out sheet required. The LFL is stocked with books for kids, teens and adults; you'll find it by the office. A huge Campers' Paradise thanks to the Wollins and Whitemans for making their brainstorm a reality and sharing it with the guests at Campers' Paradise! Ryan's eagle eye pays off! This summer, Ryan Novak has kept his eyes on the prize -- arrowheads left by long-ago Native Americans. To date, he's found three! More than likely, these arrowheads were crafted by Anishinaabeg (Ojibwe/Chippewa) peoples. What's your guess for how they got to Campers' Paradise? The 4th of July blew in with an early-morning wind and thunderstorm. But within a few hours, the weather was picture-perfect and the evening ideal for a blaze of fireworks. A crowd of kids of all ages oohed and aahed as the show lit up the night sky. Competition was fast and furious at the 2018 Nevis Pig Races on July 8. Campers' Paradise had two entries in this year's pig mania: Sunsets in the first set of races, Paradise in the second. Unfortunately, Paradise couldn't kick in into high gear and finished at the back of the herd. Between heats, the hula-hoop and jump-rope contests took over the infield. Unfortunately, not even the rollicking pig races or hula-hooping kids could foster world peace, with special guests President Donald Trump and Kim Jong Un keeping their distance. But the president's bouffant blond entry in the hair race won combs down over "little rocket man". This spring, Campers' Paradise welcome three eaglets to the nest in the big pine at the back of campsite 58. Right around the 4th, the "babies", which are as big as their parents, took wing. But they haven't gone far. You can see them sitting in the pine trees ringing the bay on the west side of the Island; listen for their high-pitched shrieks and calls. And they still rely on Mom and Dad to put breakfast and dinner on the table back at the nest. To all you parents whose "chicks" have flown, does this sound familiar? Whether it's a power walk to the mailbox on the mainland, a stroll through the towering pines or a quick loop or two around the island on your bike, check out our fitness map for the Island. Now you'll know just how far your route will take you. And maybe you can indulge in that extra s'more around the campfire. WCCO came to our lake! Twin Cities TV station WCCO featured Lake Belle Taine and Campers' Paradise on its summer-long feature, "Goin' to the Lake." You can still catch the segment at WCCO.com. If you plan to bring watercraft -- fishing boat, personal watercraft, sailboat, etc. – on your Campers’ Paradise vacation, please fill out this one-page form. See the details on our Policies page. 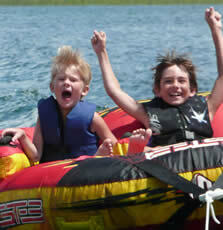 Want to know more about Lake Belle Taine? Check out the Minnesota DNR's Lake Finder for info about our favorite lake from water clarity to lake maps to a fish survey to water levels. Our historic log camping cabins, built in the '20s by Finnish craftsmen, were in need of some exterior TLC to help preserve them. In 2011, the logs were "sandblasted" with corn cobs to remove any damaged wood. Those areas were then repaired. The spaces between the logs were "remortared" and a new coat of paint applied to the trim. Here's how they look all spruced up. And this year, all the cabins and the showerhouse got classy new forest-green metal roofs. Very "in" and very retro. Whether it’s a group shot from your first visit in 1972 or a picture of last year’s fish that didn’t get away, we’d love to share your photos on our Web site. Please e-mail us your favorite photos that capture the Campers’ Paradise experience, and we’ll post them in our gallery. For more info, click on Gallery.